Shortly after being elected in 2008 to his first term in Congress, Jared Polis emailed Obama transition co-chair John Podesta to push his sister as a candidate for a presidentially appointed job with the incoming administration, according to hacked emails published online. Furthermore, Federal Election Commission records show that even after Polis's sister landed the Pentagon job, she continued to classify herself as "self-employed" when making political contributions. 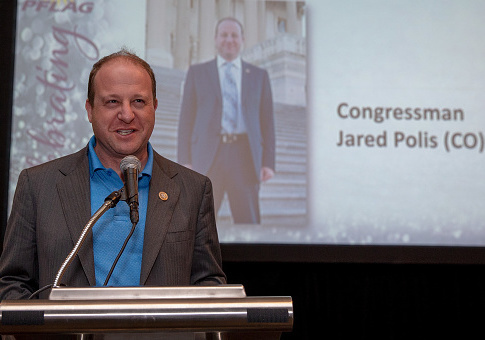 Polis is in his fifth term in Congress and is now the Democratic nominee for governor of Colorado, facing Republican State Treasurer Walker Stapleton. I wanted to put in a good word for the smartest person I know, and someone who would be an incredible asset if we can keep her in public service, my sister Jordanna Polis Schutz. … It would be great if you can help make sure she is considered for relevant positions in the administration. She has her eye on being the Assistant Director at the President's Foreign Intelligence Advisory Board. She is interested in staying in public service after her last few years of work in intelligence, and is also interesting [sic] in broadening her experience in national security. In a "thank you" email to Podesta, Schutz said, "This week I received a job offer, and my contact at OPP mentioned that you had recommended me." White House records show Schutz worked as a special assistant on policy for an undersecretary of defense in the Pentagon, but only stayed in the job for about 17 months. Still, before she ever accepted the role, Schutz openly wondered in the email to Podesta whether the job was the right fit, noting that she had she had "competing offers" from the CIA and a government contractor. "A dream job would be in the office of [Director of the Central Intelligence Agency], or on a commission similar to the Iraq WMD Commission," she wrote to Podesta. "I have asked several knowledgeable people for advice and some say ‘You'd be crazy to turn down any Series C appointment!'" she continued. "Which sounds true to me! But others say ‘Take the job only if you want to work on the [Quadrennial Defense Review] above your other options.'" Media observers noted that beyond certain Clinton-related scandals revealed in the Wikileaks cache, the amount of networking emails from Podesta's account appeared to undermine a sense of meritocracy. "Then there is the apparent nepotism, the dozens if not hundreds of mundane emails in which petitioners for this or that plum Washington job or high-profile academic appointment politely appeal to Podesta—the ward-heeler of the meritocratic elite—for a solicitous word whispered in the ear of a powerful crony," wrote historian and political analyst Thomas Frank in the Guardian. "This genre of Podesta email, in which people try to arrange jobs for themselves or their kids, points us toward the most fundamental thing we know about the people at the top of this class: their loyalty to one another and the way it overrides everything else," Frank wrote. During the months in which she was at the Pentagon, Schutz was also a major donor to her brother's joint fundraising committee that he used to steer money to other Democratic members of congress. "It can be a pretty effective way for an individual member of Congress or the Senate to build clout by sharing the wealth, so to speak," Paul Ryan, associate legal counsel for the Washington, D.C.-based Campaign Legal Center, was quoted as saying in a 2009 Denver Post article on the committee's activity. The Post report also noted that the committee was mainly funded by contributions from his family. FEC records show that although Schutz was employed at the Pentagon, she or the committee listed her as "self-employed" under the "employer" category required under disclosure laws. Neither the Polis team nor Ms. Schutz responded to requests for comment. A recent poll shows Polis leading Stapleton in the governor's race, which is expected to be the most expensive of its kind in Colorado history, thanks in large part to Polis donating nearly $20 million to his own campaign. The Boulder-based congressman was not the only Colorado politician shown to have approached Podesta about jobs in the administration. Other emails revealed by Wikileaks showed Alice Madden, a former Democratic majority leader of the Colorado House, emailing Podesta to promote a young attorney named Phil Weiser. Weiser received a gig in the Obama administration. He would later become dean of the University of Colorado School of Law and is currently the Democratic nominee for attorney general in the state. While serving as dean, emails obtained via open records laws show Weiser helped ratchet down the work required from 100 percent full time to 75 percent for a department head position for Madden, at her request. At the time, Madden was running to become a regent of the university, and had she been elected, would have effectively become an overseer of her own employer. "Will work ¾ time so have time to campaign," Madden said in an email after learning about her hire. "Dream job for me!" Other emails show Weiser personally spoke to the university provost about lowering the time Madden would need to spend on the job. This entry was posted in Politics and tagged 2018 Election, Colorado, Jared Polis, John Podesta, Obama Administration, Wikileaks. Bookmark the permalink.